The second story about young Simon and Mrs Twinkle again opens with Simon ill due to what Mum calls ‘growing pains’. ‘When would he grow out of this sickness? He thought to himself miserably.’ Instantly, there’s a tapping at his window and Mrs Twinkle, his friend from book one, suggests another adventure, saying ‘I will make you feel healthy and strong again.’ Off they set. They explore the Great Barrier Reef where Simon sees beautiful corals, meets a giant clam, and rides aboard Mr Turtle who stops once he sees his favourite food- a jellyfish. 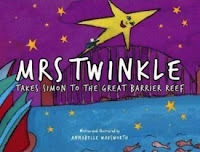 Mrs Twinkle tells Simon how important it is that he never drop plastic bags into oceans as turtles and dolphins mistake them for jellyfish, and swallow them, resulting in their death. In that moment, Simon sees it’s not a jellyfish the turtles are eating and he stops them, saving their lives. Next, Mrs Twinkle flies over Uluru, which Simon recognizes and points out to her. He wants to land on top of it but she says it’s not okay as it is sacred to Aboriginal people. Instead they walk around it and Arunta people who live there show up. They begin to ‘explain The Dreaming’ which the narrator tells readers is the name for stories passed down through generations. The narrator also says that Simon is ‘told a tale of how Earth began’ and that the men explain how they find food. As night falls, Mrs Twinkle takes Simon home. Once in bed Mum visits him, saying he’s been sleeping all morning and his fever now seems to be gone so he will be allowed to get up tomorrow. She reflects that it must be boring having to stay in bed but he thinks he’s had a great day and can’t wait for Mrs Twinkle to visit again. The size of the text’s font, its colour and the background it appears on varies constantly, breaking up the look of pages. Vivid and sparkly illustrations in bold colours show what is happening as the text tells it and will, no doubt, appeal to young readers.